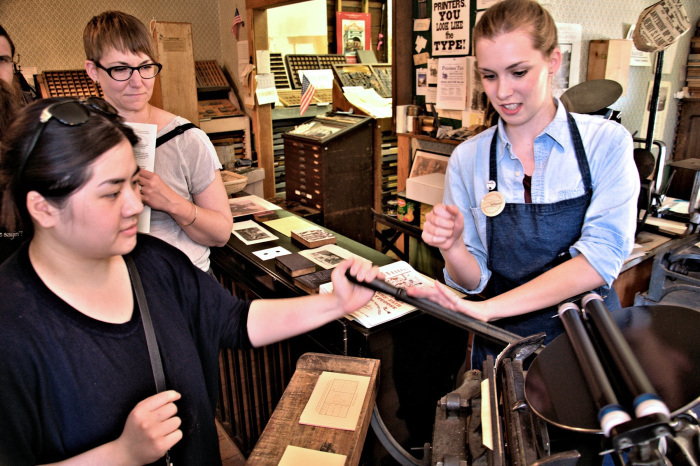 The 2017 S. F. Bay Area Printers’ Fair & Wayzgoose is coming to San Jose’s History Park on May 6, 2017. Sponsored by the San Jose Printers’ Guild, this free event celebrates letterpress printing and allied arts. 2017 marks the fourth year of the Printers’ Fair and Wayzgoose at History San Jose. Print enthusiasts, students, educators, graphic designers, typophiles, artists, and printers new or old will enjoy the demonstrations, tours, and array of vendors and exhibitors. All ages are welcome! Letterpress Printers’ Market & Shopping Letterpress Supplies and Printed Goods, Book Arts, etc. Exhibitors will be offering letterpress printed goods, artist books, fine papers, ink, handset type, and reference materials, as well as printing presses, tools, and equipment for printing and related crafts.